The International Small Group and Tree Planting Program, or TIST, is a comprehensive sustainable development program for developing-world locations. TIST trains and encourages Small Groups to develop and share "best practices." TIST introduces inproved farming and land use techniques to isolated subsistance farmers who are now planting millions of new trees. Using a combination of Small Group development and training programs and providing small stipends to groups, TIST helps local farmers meet their economic needs, even during severe dry seasons. Small Groups covenant to meet the program requirements and assure tree survival and use of improved, sustainable land use techniques for years to come. The improved farming practices and tree planting will improve local welfare by stabilizing the local food supply and by providing families with additional income from TIST tree benefits and payments. TIST Small Groups are also educated about HIV/AIDS and equipped to formulate a response to this pandemic at the group and village level. 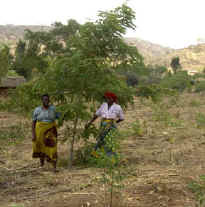 Adopting conservation farming tachniques increases food and decreases annual physical effort after the first seedbeds are created. Family members can continue to plant in these seedbeds year after year and have food. The TIST program is a joint effort of the Institute for Environmental Innovation (I4EI) and Clean Air Action Corporation.. Documents to download giving more information can be found here.